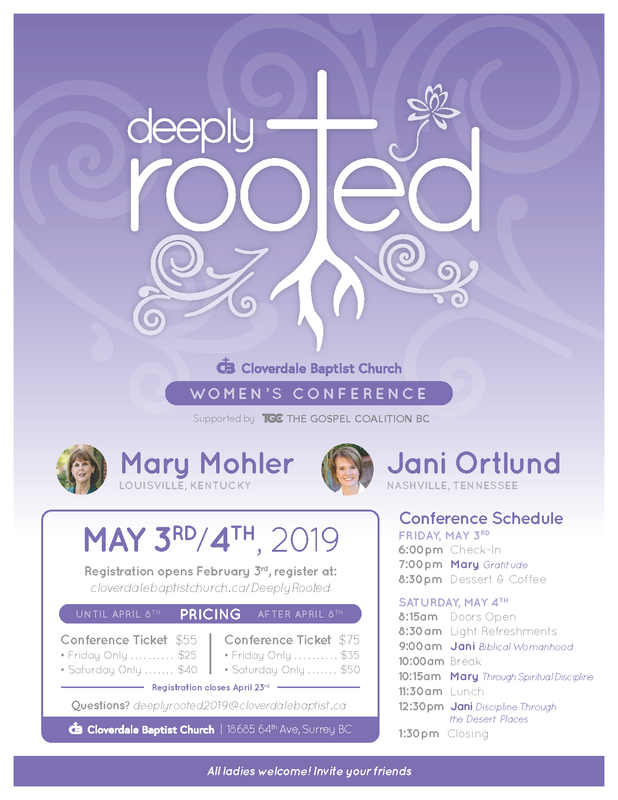 We invite you to join us for the Deeply Rooted Women's Conference! This May we are welcoming two of the most well-loved Women's Speakers in the Gospel Coalition! Mary Mohler (wife of Al Mohler) and Jani Ortlund (wife of Ray Ortlund) will be the speakers and we are so excited to have them! These two friends will be teaching from God's Word about what it means to remain Deeply Rooted in Christ through Gratitude, Biblical Womanhood, developing Spiritual Discipline and following Christ in the Desert Places. This is a rare and valuable opportunity to hear from the hearts of two wise women in your own backyard. Come refresh your heart and mind on our Savior through the teaching and encouragement of His Word! You will leave uplifted, refreshed and inspired! All ladies welcome! We would love to see you there! Registration closes on Apr 23 at midnight. Please fill out one registration form for each person attending the conference, even if you are paying for multiple people.